March is Epilepsy Awareness month. But for the 1 in 100 Canadians who live with epilepsy, Tuesday March 26 is the highlight: Purple Day. Thanks for coming back to see the answers. If you missed it check out the February archive or scroll down. Epilepsy: It’s a neurological disorder that affects 1 in 10 Canadians. 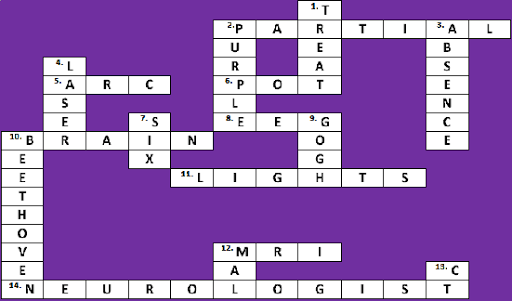 This crossword has terms that relate to epilepsy. Each answer will give you more information.